Prices include shipping in the US. Foreign orders will receive an additional invoice for shipping after the order is submitted. Please check your size before ordering. OK Stop right here: If you’re wondering “Do I need that?” then you don’t. There’s no real reason to own a pair of these in the lower 48. But, there’s a certain breed of people that just likes cold. 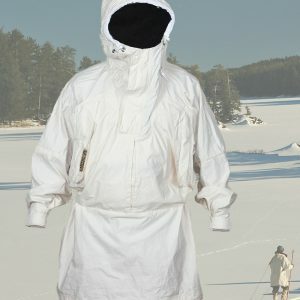 You’ll find them at high latitudes, high altitudes, and in generally dangerous conditions. They run dog teams, tend trap lines, and keep our most frigid industries and communities going. They asked for The Big Mitt, and we delivered. 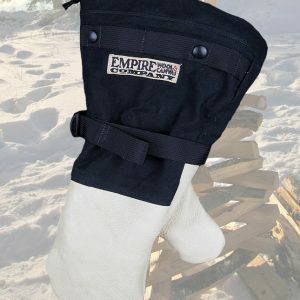 The outer shell is made from the same 10 ounce Cotton Canvas and Elk Leather as our smaller True North Mittens, but that’s where the similarity ends. The very shape and size of this pair is meant to fit over another piece of hand wear for those temperatures where you don’t expose your bare skin. We build the shells with enough girth at the cuffs so you can cork the puffiest sleeve into them. 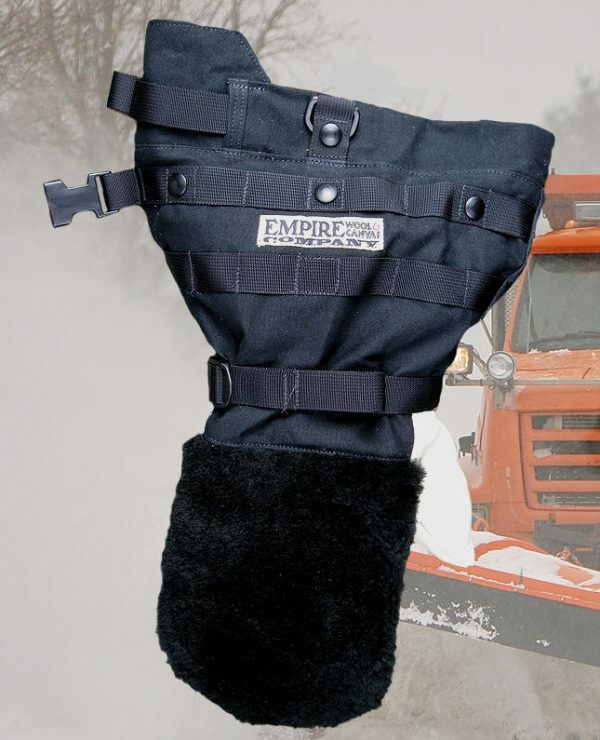 The 1″ webbing straps at the wrists and cuffs have grab loops that make them easy to operate in cold temperatures. Large Sheepskin panels cover the entire hand to cut wind chill. They’re great for scrubbing ice and snow from instrument panels and eye wear. The make a good nose wipe too. 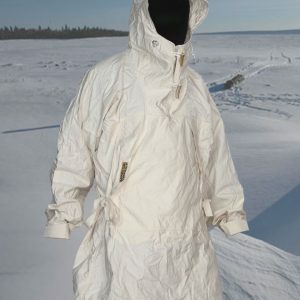 Since absolute performance is key in nasty temps, we’ve built liners from a mix of synthetics. The rear panel and lower gauntlet are a sandwich of high loft polyester filament and rip stop nylon. It slips easily over other gloves or mittens, then traps heat like a sleeping bag. The palms are made from back to back layers of recycled polyester pile for crush resistance. Snap them in at the cuff, and they offer a no-miss target for you cold hands. 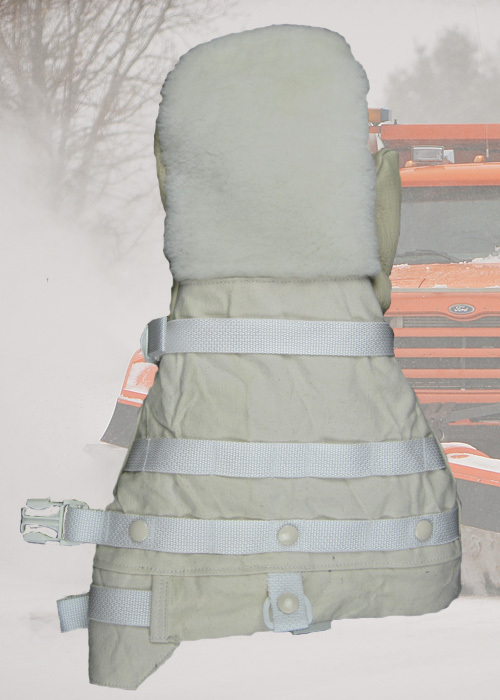 The Big Mitt comes with a set of D rings stitched into the top and bottom of the cuffs so you can add a harness. The back sides of the gauntlets sport daisy chain webbing strips for tools or a whistle. Need a Harness? 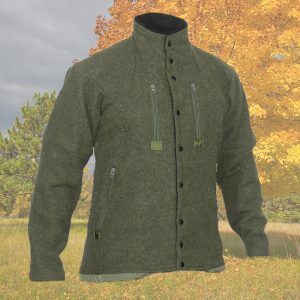 Check out Boundaryfursewing.com for a bomber rig that should work with all of our handwear. Colors: Black or Natural 10 ounce Cotton Canvas. Domestic Elk leather, and imported sheepskin. Leather and sheepskin colors will vary. Liners: 80% Polyester filament, 15% Polyester pile, and 5% Nylon. Available in Small/Medium or Large/XL. Sized to fit over working gloves or mittens. Our Mittens and Boots, like most leather goods, will require a short break in period to fully expand the liners and the shells to your hands and feet. We use game leather. You will see scars, range marks, and blemishes on our handwear and footwear.